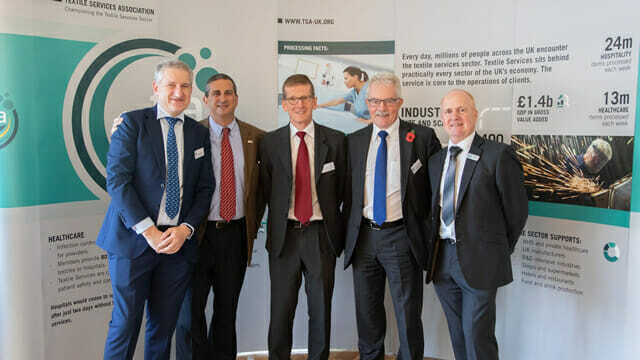 Left to Right: Anthony Kingsley, Laundry Association of Australia (LAA); Joseph Ricci, TRSA; Robert Long, European Textile Services Association (ETSA); Charles Betteridge, Christeyns and TSA (Chairman); and Philip Wright, Textile Services Association (TSA-UK). The Textile Services Association (TSA), the United Kingdom’s trade association dedicated to protecting, promoting and educating the textile care industry, recently hosted a reception at the House of Commons to highlight textile services contributions to the British economy and celebrate the launch of the TSA’s new apprenticeship program. The event attracted Members of Parliament (MPs), dozens of TSA members, apprentices and representatives from the international linen, uniform and facility services community including TRSA President and CEO Joseph Ricci, European Textile Services Association (ETSA) Executive Robert Long and Laundry Association of Australia (LAA) representative Anthony Kingsley. “The report proves that a surprising number of UK industries are reliant on textile services to operate,” said MP Hendry “Everyone from patients, tourists, factory workers and chefs rely on products processed by TSA member firms without realizing it. Yet their absence would cause monumental disruption.” He also highlighted the value of reusable textiles and the industry’s contribution to a green, circular economy.